What are the typical symptoms of venous disease? Typical symptoms include pain, heaviness, aching, and cramping in the legs. Swelling or edema is also common. In some patients, vein problems may also be associated with restless leg symptoms. You do not have to have all of these symptoms in order to have a vein problem, however. I don’t have big, bulging veins on my legs, so I must not have a vein problem, right? No. The majority of patients we treat DO NOT have large, protruding veins on their legs. Rather, they present with symptoms (see above) of venous disease. Normally functioning veins return blood back to the heart and lungs. In your legs, the contraction of the calf muscle propels venous blood back up the leg. There are a series of one-way valves within the veins that prevent the backward flow of blood with gravity. With varicose veins, there is weakening of the vein wall and dilatation of the vein. This causes the valves to malfunction and they are unable to close tightly to prevent backward movement of the blood. As a result, blood pools in the legs and results in the symptoms listed above. How does a person get varicose veins? Varicose veins are a common problem, affecting 50-60% of women and 15-25% of men. Recognized risk factors include heredity, female gender, pregnancy, obesity, and prolonged standing. How are vein problems diagnosed? Vein problems are diagnosed by the presence of symptoms suggesting venous disease coupled with confirmation by an ultrasound exam of the legs. Both symptoms AND confirmatory ultrasound findings are necessary—some patients are found to have abnormal veins on ultrasound exam but their symptoms are not consistent with venous disease. Dr. Dando’s background as a diagnostic Internal Medicine specialist helps to determine whether your symptoms are due to a venous problem or some other issue. How do you know if you need vein treatment? While some patients may present with large, bulging veins, most patients we treat do not show these visible signs of vein disease. Rather, they present with SYMPTOMS of venous disease— leg cramps, pain, heaviness, swelling, or restless legs. Patients with any of these symptoms are encouraged to schedule an appointment with us to determine if their symptoms are due to venous disease. Can vein disease be cured by compression stockings? In a word, no. Compression stockings can’t make abnormal veins normal again. Compression stockings are used as CONSERVATIVE therapy to control symptoms in those patients who do not want or who are not able to undergo definitive treatment. The use of compression stockings as a long-term solution to vein problems is utilized much less frequently today because the interventions for vein disease are much easier for patients compared to the conventional surgical techniques of years ago. 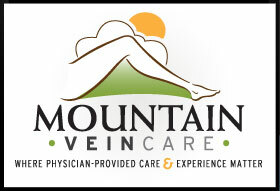 What treatment options are available at Mountain Vein Care? Mountain Vein Care offers endovenous laser ablation (EVLA), phlebectomy, and sclerotherapy— both ultrasound-guided and visual (or “surface” sclerotherapy). With these techniques, we are able to treat most ANY patient with superficial vein disease— no matter how severe. Do I have to go to the hospital for my vein procedure? No. All vein care procedures are performed in our office, avoiding the complexity and delays that can sometimes occur with procedures done in the hospital. Do I have to take time off from work for my treatments? No. Many of our patients return to work the same day, and most return the next day. Full activity is encouraged immediately after any vein procedure. Do I need to bring a driver with me to my appointment for my vein procedure? No. Patients are able to drive themselves home after the procedure. No sedation is given. The only anesthetic given is during the EVLA (laser) and phlebectomy procedures, and that is a dilute solution of Novocaine that is placed around the vein with small needles. The Novocaine does not affect the functioning of your leg. In fact, we require patients to walk in the office immediately after the procedure. Does my insurance cover vein treatments? The patient must have symptoms consistent with venous disease. No insurance will cover vein treatments for cosmetic reasons only. There must be abnormal veins present which require treatment. An ultrasound exam is performed to determine this. Most insurance plans require a 6-12 week period of conservative vein therapy (i.e. wearing compression stockings) before they will consider covering any treatment for vein problems. Our office will submit the required clinical information to your insurance company. We will review your coverage with you prior to starting any procedure. follow-up. Why do I have to come back? Comprehensive vein care involves more than simply having the initial laser surgery. At Mountain Vein Care, patients return for several sclerotherapy sessions in order to “close down” the abnormal branch veins that remain after the laser process. We have found, when seeing patients who present to us for a second opinion after having only a laser procedure done elsewhere, that many of these patients have ongoing problems because of the branch veins that were never treated with follow-up sclerotherapy. Also, in some instances, the untreated branch veins are so large that they “open up” the original vein that was lasered, prompting a repeat laser vein surgery. Who should perform my vein procedure? Modern vein medicine is practiced by physicians of multiple specialties- vascular surgeons, primary care physicians, radiologists, and gynecologists, to name a few. The specialty of the physician is not nearly as important as the physician’s experience and commitment to practicing vein medicine. Also, it is considered “best practice” to have the in-office laser vein surgery procedure performed by a physician with extensive experience and not performed by a physician extender (Nurse Practitioner or Physician’s Assistant). How many procedures has the physician successfully completed? Successful performance of a procedure over an extended period of time is probably one of the most important factors in guaranteeing a good outcome. It is very appropriate to ask your physician how many successful procedures they have performed. Physicians know how many procedures they have performed— simply answering “many” is not enough! How did they obtain their training? Most physicians practicing vein medicine today have learned their skills through interactions with other physicians more skilled in the procedure and by attending medical conferences and performing continuing medical education (although some specialties have recently introduced the minimally-invasive techniques into their programs). Do they practice vein medicine full-time, or are their vein activities part of a larger practice that involves other clinical activities? Again, proficiency in a particular procedure is improved when the physician concentrates on that procedure exclusively. Are they a diplomat of the American Board of Venous and Lymphatic Medicine? This suggests that the physician is serious about vein care and makes it a priority in their practice. Certification by the Board, which is available only to physicians, demonstrates that the physician has passed a rigorous examination and has extensive, documented experience with the procedures involved in modern Vein Medicine. Do they have additional certification in ultrasonography? Because ultrasonography is such an integral part of vein medicine, added certification from national organizations that specialize in assessing competency of ultrasonographers is a significant advantage. Common designations include Registered Vascular Technologist (RVT), Registered Physician in Vascular Interpretation (RPVI), and Registered Phlebology Sonographer (RPhS). What sort of discomfort will I have after the procedure? Generally, very minimal discomfort that is easily relieved with over-the-counter analgesics like Tylenol or Motrin. No. Today’s laser generators cause minimal to no discomfort after the procedure. At Mountain Vein Care, we use a 1320 nanometer laser generator, which produces a much longer wavelength than the older machines. Newer laser generators, with their longer wavelengths, and RF are essentially equal in the minimal amount of post-procedure discomfort that is created. The bigger factor in regards to procedure and post-procedure discomfort is related to the experience of the physician. A physician who has performed more of the procedures can generally be expected to complete the treatment with minimal to no post-procedure discomfort. The vast majority of patients that Dr. Dando has treated over the years are pleasantly surprised at the minimal amount of discomfort they have. When can I resume normal activities after my procedure? The only restriction we place on patients is after the endovenous laser procedure, and that is simply to avoid “core” activities for one week to prevent transmission of pressure back into the leg veins. Other than that, there are no restrictions. We have patients walk on the clinic treadmill immediately after each procedure, and encourage patients to stay active. Most patients return to work either the same day or the next day. What if I need heart bypass surgery later on? Will I have any veins for this? Generally speaking, the heart surgeon would not use a dilated, diseased vein to correct a blockage in a heart vessel. There are many other places that the surgeon can “harvest” a vein for a bypass procedure. When will my symptoms improve after the procedure? Most patients can expect to get relief from their vein symptoms within 2-6 weeks after the procedure, recognizing that there can be variability with patient response to treatments.